It was as gray day today in Beijing (not an unusual occurrence, it seems). It did rain some in the morning which, as Wang Wei notes, tends to wet down the dust in cities. And so it was today in Beijing. This was not a bad thing necessarily since we spent most of the day inside in meetings. We had the great fortune of meeting representatives of the Ministry of Education and the Chinese Education Assoc. for International Exchange, our hosts in China. The meeting room at the Ministry of Education was quite fancy (see above) and I felt quite a bit more important than my ordinary status as a simple schoolteacher from NJ. 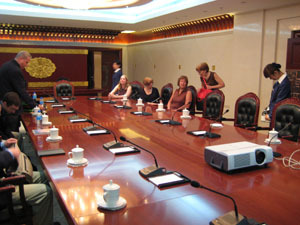 We were briefed on the state of education in China and given insight into teacher training and exchange. I was very impressed by all the speakers. 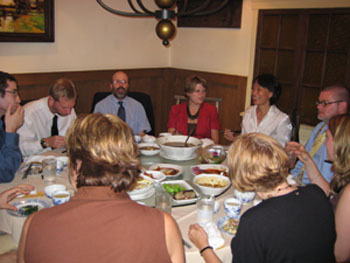 Afterwards, we were taken to a delicious Sichuan restaurant for a welcome banquet! I could get used to this . . . This entry was posted in Beijing. Bookmark the permalink.